The Page Editor is where the designer can create the desired Page, with the features and layout they need. At the top of the Form Editor, you can navigate between the Design, Workflows, Security and Settings tabs, Preview the form, and Save or Close the form. You can also return to the App Dashboard by clicking on the App Dashboard icon, or by clicking on your company’s name at the top left, before the chevron and the application’s name. 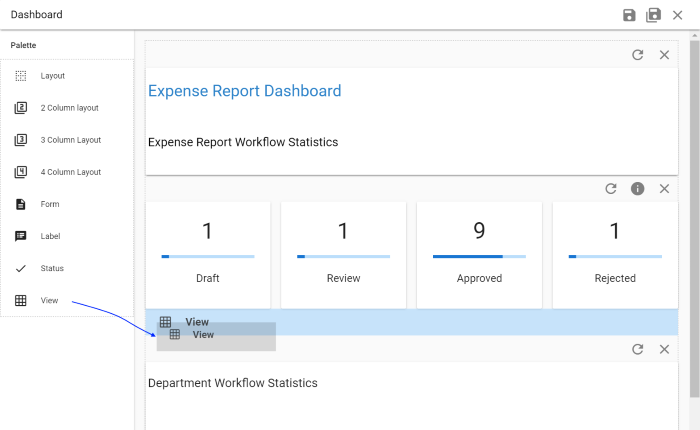 App Dashboard Closes the form editor and returns to the App Dashboard. Preview Opens the preview dialog with the current form loaded, so that the App Designer can see how it will display to end users. Save Saves all changes to the form. You will remain in the Form Editor after clicking on this option. Save & Close Saves all changes to the form. You will remain in the Form Editor after clicking on this option. Close Closes the form, returning you to the Forms Dashboard. Palette Left Side The palette is the list of layout components and page controls that can be placed onto the page. When the Properties Panel is displayed, the Palette is made narrower and only shows the icons for the layout component and fields. Page Layout Area MIddle This is where the form you are designing is built and displayed. Fields are dragged from the Palette and dropped on the Form Layout Area to created the design of the form. Properties Panel Right Side This is where all the settings for the controls can be adjusted. The Properties Panel only displays when it is activated. When you first open a page only the Palette and Page Layout Area are shown. The Properties Panel displays when the designer clicks on the properties icon for the component. You create your page by finding the desired control on the palette on the left side of the screen, then just drag & drop it onto the desired location on the page. You can also drag & drop existing components within the page to change its layout. There are also components that allow you to choose one, two three or four column layout areas, a bit like putting things in a table in a document so they stay where you want them to.